We've combined Coconut and Raw Cacao to create this decadent, creamy, melt-in-your-mouth 'Mylk Chocolate'. Supremely delicious, this healthy treat delivers a dose of these two wonderful superfoods. People really love the luxuriantly creamy flavor of milk chocolate. The unfortunate fact is that combining dairy with cacao blocks and nullifies many of its nutrients and benefits. Yet the synergy between two superfoods such as Cacao and Coconut is not only extremely healthy, but delicious in a way that simply can’t be imagined without tasting it. Our Mylk Chocolate approximates the flavour and smoothness of milk chocolate without using any dairy or cane sugar. With up to twice as many antioxidants as conventional chocolate, we use organic evaporated coconut nectar (a natural, low GI sweetener) instead of cane sugar to create this delicious treat. The coconut we use at Loving Earth is certified organic and sulphite free. A rich source of lauric acid (antifungal, antimicrobial), coconut is also a rich source of dietary fibre. 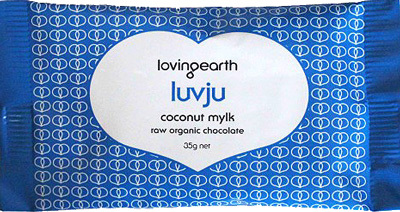 We’ve managed to get our hands on the first compostable metalised film that’s just come out in Europe for our Luvju bars. We’ve had it laminated to a paper finish on the outside, so it’s actually 96% plant-based compostable material. The dispenser box is printed on recycled board with vegetable inks and includes a unique design incorporating a totem on the front to reflect the spirit of each flavour.